The HC3 is a professional RIGID-electronic and is usefull for the replacement of the mechanical assistant-paddel at the head of the rotor. Helicopter models without paddles, due to their reduced rotational weight, are much more agile, more manoeverable and have approx.15% more performance. Ignoring the work saved in setting-up the paddle mechanics and using the HC3 –Xtreme, the result is a huge performance increase. The precision throughout the flight envelope is outstanding,not only in dynamic manoevers such as, (F3N-Flight stylel) and aerobatics (F3C), but also hover stability, all figures now are flown as if on rails, i.e. without interfering external influences and with no control overshoot. This is achieved with minimal setting-up thanks to the intelligent and optimised governing algorithms! Using the latest generation high-end Silicon-MEMS-Sensors, the HC3-Xtreme is fully 3D-capable and has an extremely good and ultra-quick tail responsel. The use of an external gyro is no longer necessary! At last, one now can have a symmettrical acting anti- torque control.. The resulting increased tail-holding powerl has been made possible with the tail gyro being coupled with the rotor-head pitch data internally in software. The system is suitable, naturally, for flybarless helicopters (2 and 4 blade), as well as other flybarless helicopters such as Trainers etc. It is equally suitable for, electric, I.C. powered as well as turbine helicopter models. The HC3-Xtreme has no Horizontal- or Position-Stabilisation and therefore is totally acceptable for use in competitions. The head gyro eliminates any tiresome rigid-rotortendencies, resultig in the best possible control response and precision. The CNC-machined aluminium casing as well as the top quality design fit seamlessly into all that is best from today’s large helicopter manufacturers. The very compact form and the flexibilty of installation, make it possible to be used in almost every helicopter, from Micro-Helis right up to 3,5m-Scale-Helicopter. The set-up is kept to a bare minimum, thanks to separate channels being used for the gain of the head and tail-rotor. Direct USB-connection for quick programming; the easy to use set-up software is included in the bundle. The connetor lead between receiver and HC3-Xtreme is fitted with dual plugs. Gold-plated PCB and latest generation MEMS-Sensors on all 3 axes. 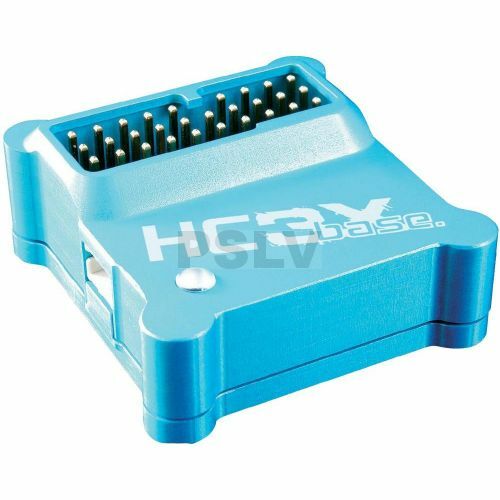 The HC3-Xtreme is configured ready to connect to serial port SP receivers, such as robbe RASST receivers R6007SP and R6107SP, whereby the receiver connection is reduced to just one lead. The throttle channel output can also be used on HC3-Xtreme. Software adaptation to suit connect it to the Futaba S-BUS System as well as other satellite-receivers are in preparation. HC3-Xtreme is fitted with a Flash-Memory and can be updated with the latest software whenever necessary. The system is future-proof and can always be updated to suit further developments in software and helicopter mechanical design. It may be used with all popular analogue-, digital- and brushless servos, including the narrow-pulse- tail servos (760µs) (For example, robbe-Futaba Servos S 9256 or BLS 251). All common swashplate varieties, including four servo and virtual swashplate rotation can be used (H1, H3-90°, H3-120°, H3-140°, H4-90°, H4-90°+45°).